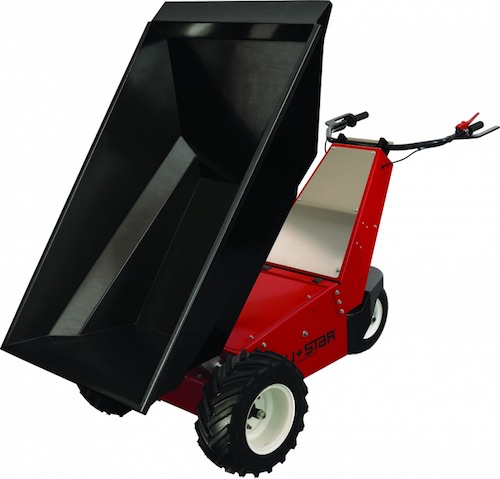 Looking to rent the best, large capacity Power Pusher, electric wheelbarrow in Rochester, Ithaca and Upstate NY? The Duke Company rents the exceptional Power Pusher E-750. Renting this powerful electric wheelbarrow from the Duke Company will enable your crew to safely and easily move loads up to 1,000 pounds. The heavy-duty, high-density tub and powered wheel barrow will allow your crew to safely move heavy materials without the risks of manually-operated wheelbarrows. Electric power-train, powered by 24v rechargeable battery. Run five miles on just one charge. Capable of hauling 1,000 pounds at 4 MPH. Quiet, electric motor that can be operated indoors or environmentally sensitive areas. Power dump capability – for safe dumping of materials with only a push of a button.